Your life as a digital analyst is about to change even more. People with practical experience in the use of AI share the ups and downs to help you prepare for your future. AI is a collection of advanced methods for forward-thinking capabilities — these methods include: natural language processing, computer vision, robotics, expert systems, intelligent agents, machine learning, cognitive computing, and fuzzy logic. 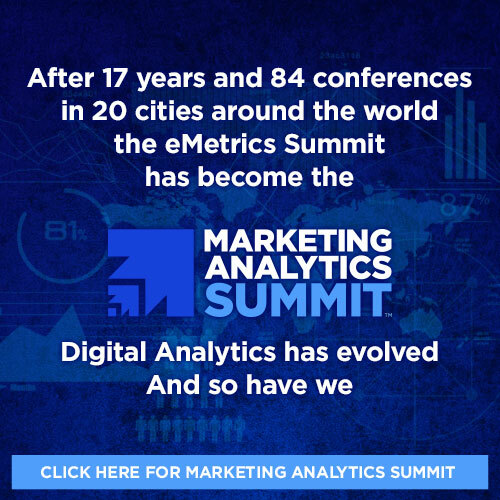 For more on machine learning in particular, see eMetrics’ sister event, Predictive Analytics World (co-located), which is devoted entirely to the application of machine learning to all aspects of business. Frameworks, strategies, blueprints, tricks and tips. Major brands and leading consultants impart their best advice for collecting, integrating, testing, correlating and making the most of online data. From change management to data governance and from analytics maturity to advanced visualization, this cadre of authorities covers the management side of getting the biggest bang from big data.